Our team oversees and advances UD’s strong culture of compliance with federal, state and University policies and regulations across the spectrum of the University’s research-related activities. We are responsible for the review, negotiation and establishment of research agreements, and the administrative transfer of research materials to and from UD. 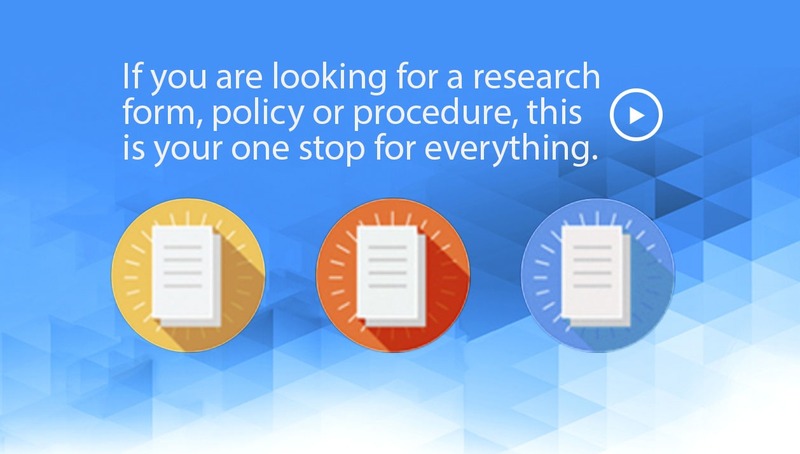 Whether you’re a first-timer or a veteran at developing research proposals, you will find the tools you need here to prepare your proposal, manage your grant, protect your great ideas and inventions, and present your results to the scientific community and the public. Ensuring responsible conduct of research and upholding the highest ethical standards are paramount to UD and the nation. Advice and counsel on the disclosure of innovations, patents, copyrights, trademarks, contracts and other research-related agreements. Research involving human subjects, bio specimens and/or tissue samples, and/or private identifiable data must be reviewed. A resource used to ensure the safety of researchers and others. Oversight and administration of regulations regarding UD research and its impact on economic and trade sanctions against certain nations, entities and individuals. Federal regulations require all use of non-human vertebrate animals in research, teaching and testing follow established guidelines. 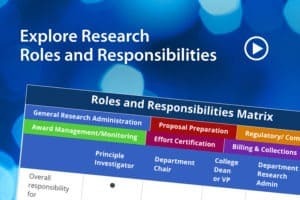 The roles and responsibilities of research administration at UD. All work involving recombinant DNA at the university must be approved by the University Biosafety Committee and the Biosafety Officer. UD is committed to high ethical standards and enforcing its policies, procedures and all applicable legal requirements. The University of Delaware is committed to promoting and protecting the responsible pursuit of scientific research. 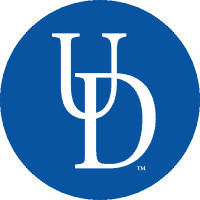 UD faculty and students are obligated to practice intellectual honesty and to observe established professional standards in their fields at all times, from the formulation of proposals, to their interactions with research associates and students, to the collection, handling and evaluation of data, to the peer review process, and the protection and presentation of results. 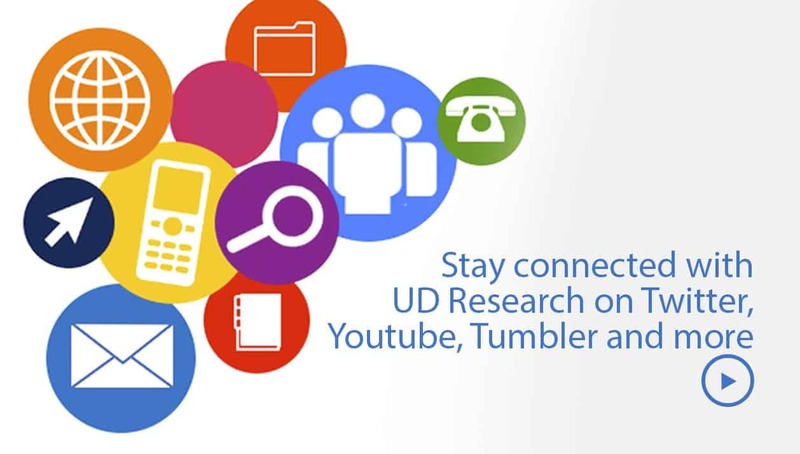 All members of the UD research community are expected to follow the highest ethical standards and encouraged to report any concerns they may have by contacting the Associate Vice President for Research & Regulatory Affairs in the UD Research Office directly, or the Compliance Hotline. UD policy and Federal requirements (Pilot Program) prohibit retaliation against an individual making a misconduct allegation in good faith. The University of Delaware (UD or University), its faculty, staff and students are committed to conducting their research and scholarly endeavors with the highest ethical standards. Consistent with federal government guidelines and requirements, and with widely-recognized best practices to achieve the responsible conduct of research, the University has developed, conducts and maintains current an effective Research Compliance & Ethics Program (RCEP). 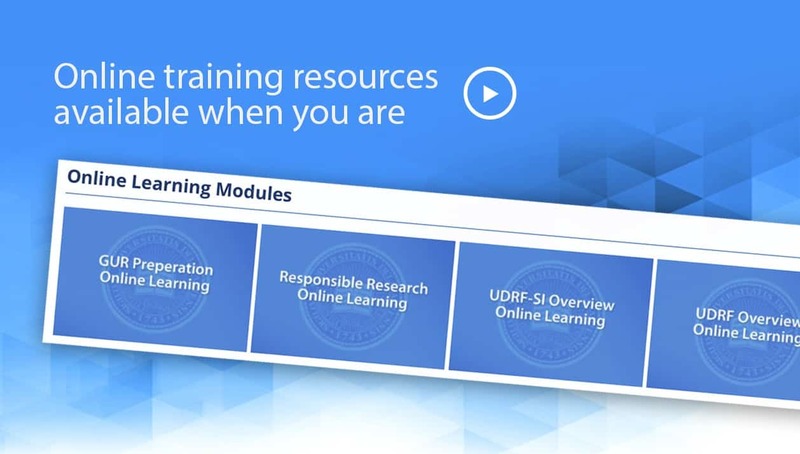 In doing so, UD exercises due diligence to prevent, detect and correct any research-related conduct that is not consistent with government and best-practice collective tenets. Additionally, the University creates and promotes, in an ongoing fashion, an institution-wide culture that encourages behavior/conduct that is ethical, complaint and in accord with applicable research-related requirements, guidelines and best practices. 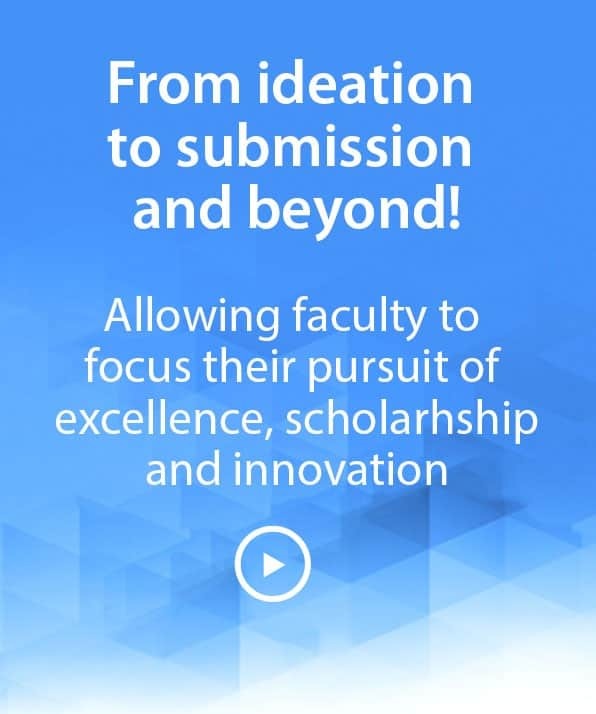 From its inception, the American Association of University Professors has recognized that membership in the academic profession carries with it special responsibilities. The Association has consistently affirmed these responsibilities in major policy statements, providing guidance to professors in such matters as their utterances as citizens, the exercise of their responsibilities to students and colleagues, and their conduct when resigning from an institution or when undertaking sponsored research. The Statement on Professional Ethics that follows sets forth those general standards that serve as a reminder of the variety of responsibilities assumed by all members of the profession. In the enforcement of ethical standards, the academic profession differs from those of law and medicine, whose associations act to ensure the integrity of members engaged in private practice. In the academic profession the individual institution of higher learning provides this assurance, and so, should normally handle questions concerning propriety of conduct within its own framework by reference to a faculty group. The Association supports such local action and stands ready, through the general secretary and Committee B, to counsel with members of the academic community concerning questions of professional ethics and to inquire into complaints when local consideration is impossible or inappropriate. If the alleged offense is deemed sufficiently serious to raise the possibility of adverse action, the procedures should be in accordance with the 1940 Statement of Principles on Academic Freedom and Tenure, the 1958 Statement of Procedural Standards in Faculty Dismissal Proceedings or the applicable provisions of the Association’s Recommended Institutional Regulations on Academic Freedom and Tenure. Professors, guided by a deep conviction of the worth and dignity of the advancement of knowledge, recognize the special responsibilities placed upon them. Their primary responsibility to their subject is to seek and to state the truth as they see it. To this end, professors devote their energies to developing and improving their scholarly competence. They accept the obligation to exercise critical self-discipline and judgment in using, extending and transmitting knowledge. They practice intellectual honesty. Although professors may follow subsidiary interests, these interests must never seriously hamper or compromise their freedom of inquiry. As teachers, professors encourage the free pursuit of learning in their students. They hold before them the best scholarly and ethical standards of their discipline. Professors demonstrate respect for students as individuals and adhere to their proper roles as intellectual guides and counselors. Professors make every reasonable effort to foster honest academic conduct and to ensure that their evaluations of students reflect each student’s true merit. They respect the confidential nature of the relationship between professor and student. They avoid any exploitation, harassment or discriminatory treatment of students. They acknowledge significant academic or scholarly assistance from them. They protect their academic freedom. As colleagues, professors have obligations that derive from common membership in the community of scholars. Professors do not discriminate against or harass colleagues. They respect and defend the free inquiry of associates. In the exchange of criticism and ideas, professors show due respect for the opinions of others. Professors acknowledge academic debt and strive to be objective in their professional judgment of colleagues. Professors accept their share of faculty responsibilities for the governance of their institution. Ensuring the responsible conduct of research is paramount. “Scientific research is grounded in values such as integrity, honesty, trust, curiosity and respect for intellectual achievement. The expression of these values in the diverse styles and approaches of the various scientific disciplines has contributed directly to the discovery of knowledge and thus to the achievements of the U.S. scientific research enterprise,” noted the National Academy of Sciences’ Committee on Science, Engineering and Public Policy in the report, On Being a Scientist: Responsible Conduct in Research. However, as the report goes on to say, growth of the U.S. research enterprise, changing social expectations about the accountability of scientists, increasingly complex research that places new demands on scientific oversight and expanded commercialization of research results have catalyzed the formation and implementation of new policies and regulations by academic institutions and funding agencies to safeguard the process of science in today’s academic research arena. These standards of conduct are critical to every step of the UD researcher’s pursuit of the truth, from the formulation of proposals, to interactions with research associates and students, to the collection and handling of data from experiments or other scholarly activity, to the evaluation of that data, peer review and protection and presentation of results. Furthermore, research involving human or animal subjects must be administered according to established University policies and federal regulations and with a commitment to the highest ethical standards. Every UD researcher needs to understand and comply with the policies and procedures, established by the University and the federal government, that are relevant to his or her research. You’ll find links to a complete listing of UD’s policies, along with required forms, highlighted in the blue box above and on our Policies & Forms page on this website. On Being a Scientist: Responsible Conduct in Research. (Committee on Science, Engineering, and Public Policy, National Academy of Sciences, National Academy Press, 1995). Responsible Conduct of Research Education Committee. Part of the Association for Practical and Professional Ethics, this committee provides leadership to the research community in identifying and developing education programs in the responsible conduct of research. Responsible Conduct Courses. This Web site, produced by Columbia University with support from the Department of Health and Human Services, presents case studies on conflicts of interest, mentoring, peer review, misconduct and data management. It is the policy of the University of Delaware to abide by the OSTP policy in all University research. Any intentional distortion of research data, or intentional distortions of information or conclusions derived from research data, constitutes misconduct in research and is prohibited by University Policy. 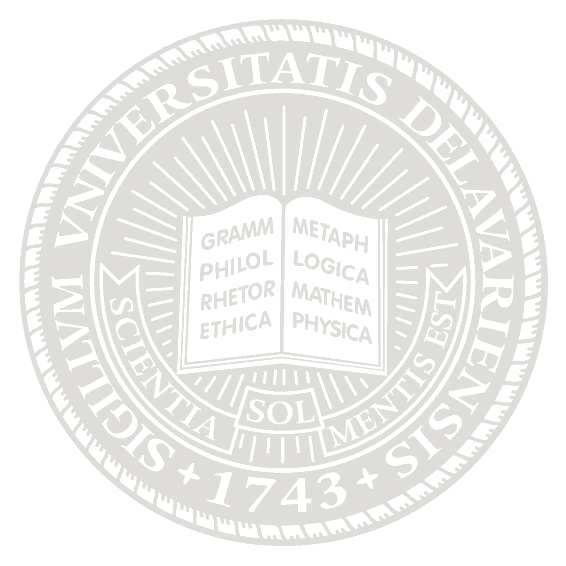 The University of Delaware has the ethical responsibility to prevent misconduct in research, and the legal responsibility to inquire into all allegations of research misconduct, and to report and investigate all instances where a reasonable presumption of misconduct is established by inquiry. The University, the state, suppliers of grant accounts, clients of consultation services and the public all have the right to expect and demand unbiased and factual information from University personnel. In the long run, University personnel benefit individually and collectively from the maintenance of high ethical standards. An atmosphere of intellectual honesty enhances the research process and need not inhibit productivity and creativity. Establishing and maintaining such an atmosphere is a responsibility that must be accepted by all University personnel. Involvement of faculty or professional staff with appropriate commercial enterprises is an important part of the transfer of knowledge and it is encouraged by the University to enhance both teaching and research programs. Association of faculty and professional staff with commercial enterprises should be such that it benefits all the parties involved, including the University. All employees are expected to conduct their professional and personal duties with maximum integrity, and to avoid association with any activities that could diminish the effectiveness of their commitment to the University. It is the responsibility and obligation of faculty and professional staff to disclose all significant financial and commitment interests that may affect, or appear as if they could affect, their professional responsibilities. University of Delaware’s Research Policy 6-11 defines a potential conflict of interest (COI) as an occurrence when there is a divergence between an individual’s private interests and his or her professional obligations, such that an independent observer might reasonably question whether the individual’s professional judgment, commitment, actions or decisions could be influenced by considerations of personal gain, financial or otherwise. The form describes the different categories of SFIs that are required to be disclosed. A table of examples is provided as a reference. Please know this is not an all-inclusive reference, just a few examples for illustrative purposes. If answering “Yes” to any of the listed questions, a pull down menu of required information will show. Please provide enough detail to facilitate its assessment. Guidance: Management of Conflict of Interest (COI) in Collaborations under Small Business Innovation Research (SBIR) and Small Business Technology Transfer Research (STTR) programs. The University of Delaware (UD or University) encourages the involvement of its faculty and professional staff with appropriate commercial enterprises in ways that will enhance the teaching and research programs at UD. The Small Business Innovation Research (SBIR) and the Small Business Technology Transfer Research (STTR) are programs funded by the federal government that enable small businesses to enrich their research and development (R&D) efforts and explore the commercialization potential of innovative technologies and products. 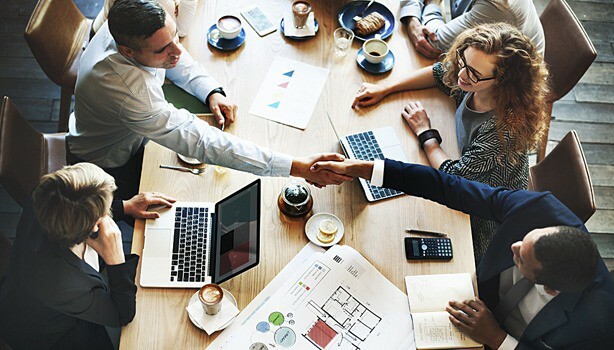 These two programs allow, and in the case of STTR agreements require, collaborations between small businesses and not-for-profit research institutions. 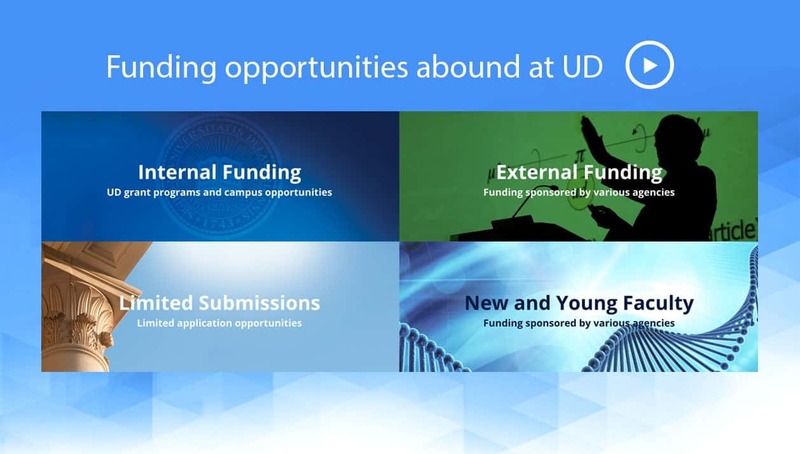 UD may collaborate as a subcontractor with small businesses receiving funding under the SBIR and STTR federal programs. These types of partnerships sometimes can present complicated conflict of interest (COI) situations when the involved investigators at the University, or their immediate family members, have ties with the small business receiving the award. The following guidelines may assist University employees and their supervisors in establishing appropriate COI management plans as prescribed by federal requirements and UD policies and procedures. In accordance with the University “Conflict of Interest Policy and Procedures for Faculty and Staff “ (Research Policy 6-11), faculty and professional staff must disclose their significant financial interest as defined in the Policy, in addition to those of their spouses and dependent children. Disclosures must be completed via UD web form annually and within 30 days of any changes to previously disclosed interests. Elimination of conflicting role: The investigator for the small business SBIR/STTR application and the investigator for the subcontract to UD must be different individuals. A UD investigator may be requested to forgo any fiduciary role with the small business while the proposed research is active. 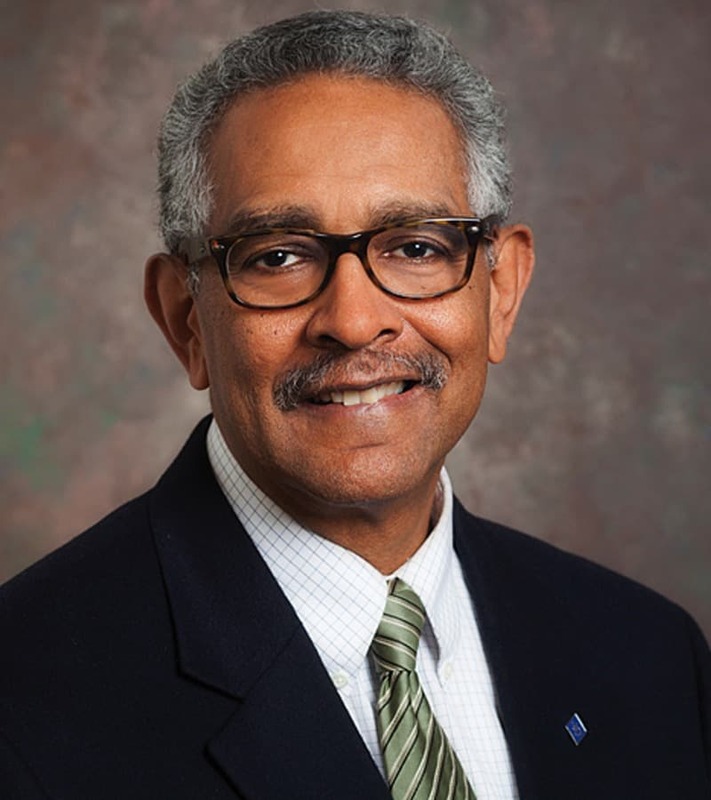 Alternatively, a different UD employee, with no ties to the small business, may be assigned by the chair and/or dean to serve as the principal investigator for the University research effort. Clear delineation of roles: The proposal must clearly delineate the roles of each participant in the agreement/partnership. No individual shall have conflicting technical or managerial roles simultaneously in the small business research and the University research. In addition, the small business must have evidence of functioning space in which R&D activities can and will take place. Small business research must be conducted using the small business facilities and personnel. Collaborative research may be carried out at UD facilitates consistent with the terms and conditions of the subcontract agreement. Independent oversight (Arbitrator): If deemed necessary, a UD faculty member who does not have a significant financial interest in the small business should be appointed by the chair and/or dean to act as a technical arbitrator for COI-related concerns for the project. The chair and/or dean may assume the arbitrator role as part of the management plan. Intellectual property protection, ownership and commercialization: Intellectual property rights and interests typically will be addressed consistent with UD Research Policy 6-6 and the applicable terms of the subcontract agreement. Increased reporting: In addition to clearly delineating roles in the proposal, more frequent reporting or meetings at the department or college level may be required. Public disclosure: Written disclosure of financial interests in the small business shall be required to collaborators in the effort, and in publications or other public presentations of research results. Faculty and Investigators – are responsible for submitting their annual significant financial disclosure in accordance with the UD policy and procedures. In addition, faculty and investigators should seek guidance from their supervisor(s), and the Research Office if needed, to discuss potential COI concerns. Arbitrator(s) (independent scientific reviewer(s)) – are responsible for the review of manuscripts, presentations and completed data resulting from the collaboration to ensure no bias due to the COI. Department Chairs and College Deans – review significant financial disclosures, make COI determinations, develop COI management plans, as deemed appropriate, and ensure compliance with such management plans. Vice President for Research, Scholarship and Innovation – if the faculty or staff members object to the resolution offered by the chair and dean, the matter shall be referred to the University VPR who will intercede in accordance with UD Research Policy 6-11. “Significant Financial Interest” refers to a financial interest, as described in Section V of UD Research Policy 6-11, that reasonably appears to be related to the employee’s institutional responsibilities. “Financial conflict of interest (FCOI)” refers to a significant financial interest that could directly and significantly affect the design, conduct or reporting of research. 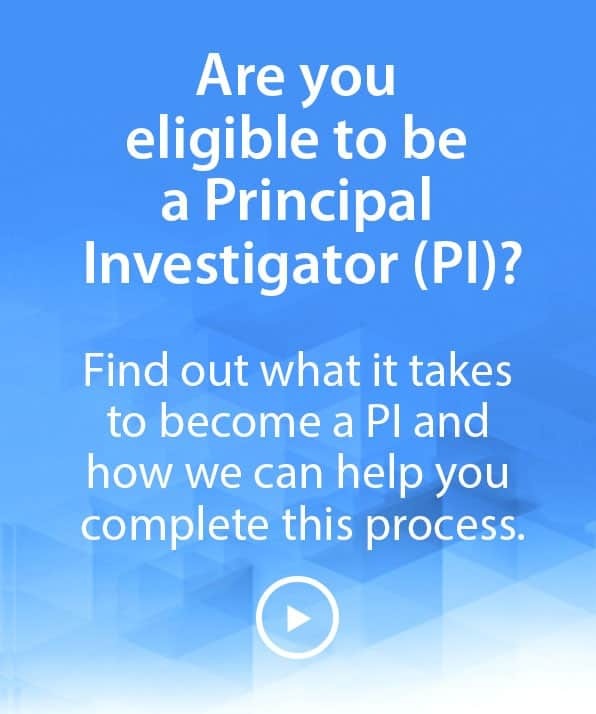 “Investigator” refers to the project director or principal investigator and any other person, regardless of title or position, who is responsible for the design, conduct or reporting of research. Entity(ies) related to employee's institutional responsibilities Participation in, or personal sponsorship from, any entity that invests in, or provides financial support for, activities related to the employee's University areas of responsibility. The University of Delaware (UD or University), its faculty, staff and students are committed to conducting their research and scholarly endeavors with the highest ethical standards. Consistent with Federal Government guidelines and requirements, and with widely-recognized best practices to achieve the responsible conduct of research, the University has developed, conducts and maintains current an effective Research Compliance & Ethics Program (RCEP). 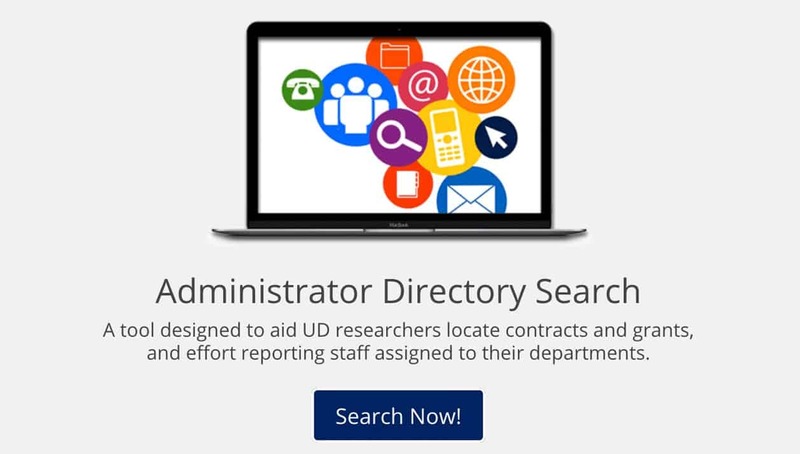 In doing so, UD exercises due diligence to prevent, detect and correct any research-related conduct that is not consistent Government and best-practice collective tenets. Additionally, the University creates and promotes (in an ongoing fashion) an institution-wide culture that encourages behavior/conduct that is ethical and complaint, and in accord with applicable research-related requirements, guidelines and best practices. To those ends, the University established and maintains standards and procedures to prevent, detect and correct research-related behaviors that may be (or have the potential to become) aberrant. Methods to keep UD executive leadership knowledgeable with regard to the University RCEP are in place and maintained, so as to accommodate oversight of Program efficacy. Program standards, guidance and training extend to research efforts that include (or potentially include) matters concerning 1) animal care & use, 2) conflict of interest, 3) confidentiality, 4) cost accounting 5) data management, 6) export controls & trade sanctions, 7) freedom-of-information requests, 8) human subject protection, 9) intellectual property, 10) research integrity and misconduct, 11) research-related agreements, and 12) research-related safety (bio-, chemical & hygiene, hazardous substances, radiation and LASER). The Deputy Provost for Research and Scholarship, is the University’s Chief Research Administrator & Advocate. The Ofice of Research and Scholarship ensures the presence and maintenance of an adequately-funded and effective research RCEP. Day-to-day operational responsibility for the Program is delegated to the Associate Deputy Provost for Research and Regulatory Affairs, who with colleagues and in cooperation with UD faculty who serve on and chair University compliance and safety committees are tasked to knowledgeably and competently perform the multi-disciplinary duties needed to ensure that the UD research community goes about its work in a compliant and responsible manner. All University persons performing day-to-day operations aimed at maintaining the integrity of the RCEP 1) have no-known transgressions (past or current) from Program tenets, and 2) have direct access to the Office of the University Research and Regulatory Affairs. 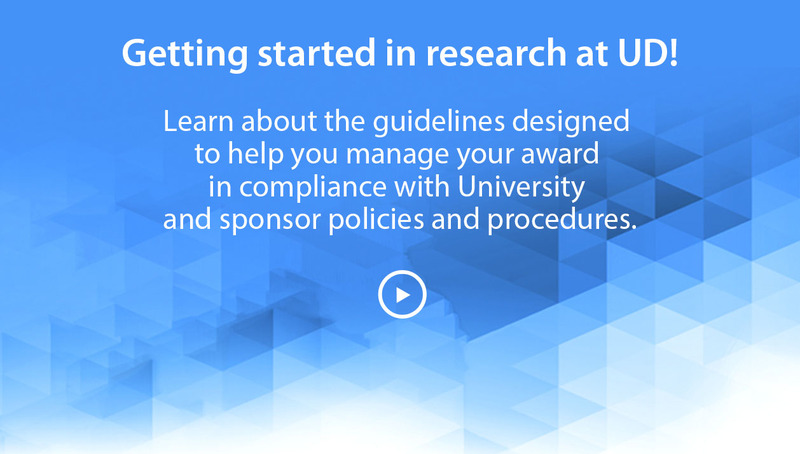 In order to maintain Program effectiveness, the Office of the University Research and Regulatory Affairs oversees and provides a wide spectrum of research-related compliance and ethics training. Training media include web-based presentations and face-to-face presentations. Face-to-face training is offered for groups or individuals, and is offered on regularly scheduled intervals and upon request. Training is typically tailored for students, research-support staff, faculty and other research professionals, across the full spectrum of research-related RCEP topics. To ensure that UD’s research community adheres to the requirements of the Program, provisions for periodic monitoring and audit are in place. Additionally, the Program offers anonymous avenues for the reporting of University-research activities that may be suspected of being inconsistent with the responsible conduct of research. As a result of an institutional-wide adherence to a Program of recognized and required research-related compliance and ethical morays, UD maintains an ability to provide an open and supportive environment for the conduct of research, while remaining able to quickly identify abhorrent behavior and suspend offenders. Finally, to help ensure (and confirm) institutional commitment to providing an effective RCEP, the UD Program is periodically assessed internally (with the assistance non-Program University personnel), and modified as necessary to remain aligned with, and responsive to, modifications in Federal Government and best-practice standards. Additional information regarding the University RCEP may be accessed by sending an email request to udresearch@udel.edu. 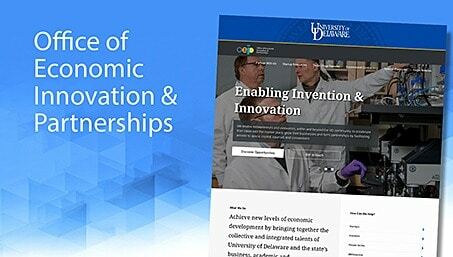 The Office of Economic Innovation and Partnerships (OEIP) is responsible for the management of all intellectual property developed at the University of Delaware. In this role, OEIP provides advice and counsel to UD faculty and staff regarding the disclosure of innovations, patents, copyrights, trademarks, contracts and other research-related agreements. Make sure you understand how to protect your research results and who owns the data generated in UD research. Review this guide for a helpful introduction. Do I need patent, trademark and/or copyright protection? Patents protect inventions and improvements to existing inventions. Copyrights cover literary, artistic and musical works. Trademarks are brand names and/or designs which are applied to products or used in connection with services. What is an invention, and who owns the inventions made by UD faculty, staff or students? The University of Delaware is required by law to report its inventions made under federal grants/contracts to the agency, and may elect to own and promote them for commercialization. If you are a UD researcher with an invention to protect, please review these policies and forms and contact the Intellectual Property and Technology Transfer Office of the UD Research Office for more information. A patent for an invention is the grant of a property right to the inventor, issued by the U.S. Patent and Trademark Office. Generally, the term of a new patent is 20 years from the date on which the application for the patent was filed in the United States or, in special cases, from the date an earlier related application was filed, subject to the payment of maintenance fees. U.S. patent grants are effective only within the United States, U.S. territories, and U.S. possessions. Under certain circumstances, patent term extensions or adjustments may be available. The right conferred by the patent grant is, in the language of the statute and of the grant itself, “the right to exclude others from making, using, offering for sale, or selling” the invention in the United States or “importing” the invention into the United States. What is granted is not the right to make, use, offer for sale, sell, or import, but the right to exclude others from making, using, offering for sale, selling, or importing the invention. Once a patent is issued, the patentee must enforce the patent without the aid of the U.S. Patent and Trademark Office. Throughout the world the first party responsible for filing a patent application is the undisputed owner of the invention. The United States has a one-year time period to file a patent application. This period begins at the formal presentation of the invention. A formal presentation of an invention includes any publication, journal, conference presentation, poster session, newspaper article, Internet publication on a Web page, blog, listserve, etc. In most other countries, you are banned from obtaining patent protection once an invention has been publicly disclosed. You must file in the United States within one year of the first disclosure of the invention — filing of a provisional application may protect international rights. It takes an extended period of time to obtain a patent. The patent application can be kept secret while it is pending if you request it; otherwise, it is published by the U.S. Patent and Trademark Office 18 months after filing. See Policy 6–6 — “Intellectual Property Protection, Ownership, and Commercialization” for detailed information on patent procurement costs and the division of patent income. As defined by the U.S. 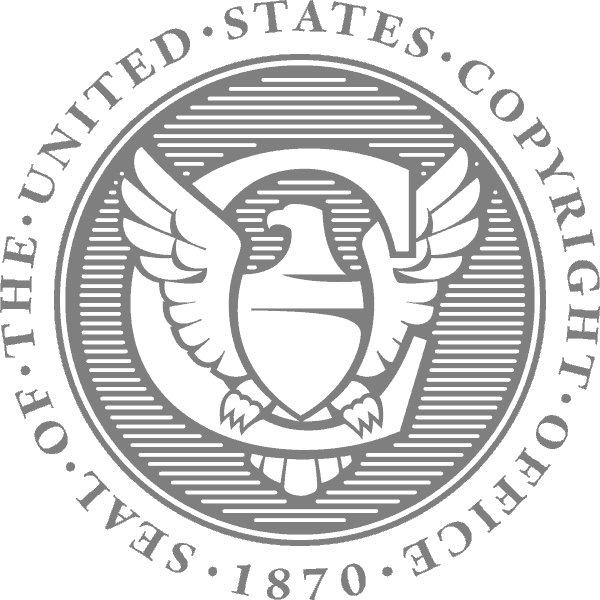 Copyright Office, copyright is a form of protection provided by U.S. law to the authors of “original works of authorship” fixed in any tangible medium of expression. The manner and medium of fixation are virtually unlimited. Creative expression may be captured in words, numbers, notes, sounds, pictures, or any other graphic or symbolic media. The subject matter of copyright is extremely broad, including literary, dramatic, musical, artistic, audiovisual, and architectural works. Copyright protection is available to both published and unpublished works. Under the 1976 Copyright Act, the copyright owner has the exclusive right to reproduce, adapt, distribute, publicly perform, and publicly display the work. In the case of sound recordings, the copyright owner has the right to perform the work publicly by means of a digital audio transmission. These exclusive rights are freely transferable and may be licensed, sold, donated to charity, or bequeathed to the copyright owner’s heirs. It is illegal for anyone to violate any of the exclusive rights of the copyright owner. If the copyright owner prevails in an infringement claim, the available remedies include preliminary and permanent injunctions (court orders to stop current or prevent future infringements), impounding, and destroying the infringing articles. The exclusive rights of the copyright owner, however, are limited in a number of important ways. Under the “fair use” doctrine, which has long been part of U.S. copyright law and was expressly incorporated in the 1976 Copyright Act, a judge may excuse unauthorized uses that may otherwise be infringing. Section 107 of the Copyright Act lists criticism, comment, news reporting, teaching, scholarship, and research as examples of uses that may be eligible for the fair use defense. In other instances, the limitation takes the form of a “compulsory license” under which certain limited uses of copyrighted works are permitted upon payment of specified royalties and compliance with statutory conditions. The Copyright Act also contains a number of statutory limitations covering specific uses for educational, religious, and charitable purposes. Pursuant to the Copyright Act of 1976, this is a term with two meanings. First, it refers to the person or entity listed as the owner in the U.S. Copyright Office, usually the original author or developer. Second, it refers to a person or entity to which an exclusive part of the copyright has been transferred in writing. The person who creates the work is not always the author of the work. The author is either the person who creates the work, the person or business that pays another to create the work in an employment context, or the person or business that commissions the work under a valid work-for-hire contract. Purely factual information within a work is not protected by copyright, as well as utilitarian aspects of a work. Although the general rule is that the person who creates a work is the author of that work, there is an exception to that principle: the copyright law defines a category of works called “works made for hire.” If a work is prepared by an employee or prepared under a signed written contract designating it as a “Work Made for Hire,” the employer, and not the employee, is considered the author. The employer may be a firm, an organization, or an individual. For joint authorship, contribution by the author must be copyrightable. Each author must have intended to collaborate at the time the work was created. Common ownership of copyright can be Joint Exploitation or Duty to Account. Under the current law, termination of a grant of rights after 35 years may be made under certain conditions by serving written notice on the transferee within specified time limits. For works already under statutory copyright protection before 1978, the present law provides a similar right of termination covering the newly added years that extended the former maximum term of the copyright from 56 to 95 years. For further information, visit the U.S. Patent and Tradmark Office website. Upon completion of an original work in tangible form — a process that generally takes four to five months. It is recommended that you include a copyright notice on the title page of your thesis or dissertation. You should include the copyright symbol ©. You should place your name next to the symbol to identify yourself, if you are the copyright owner, as the copyright owner. Although no longer necessary, you should also include the words “all rights reserved” below the copyright symbol and name. It is not necessary to obtain permission to use works in the public domain. Works are in the public domain if the copyright on the work has expired or the work was never copyrighted at all. Although permission is not needed, the work needs to be properly acknowledged. When using copyrighted works, it is necessary to acknowledge the source and to obtain written permission unless such use falls within the “fair use doctrine.”The above information is provided by the U.S.For more information, see UD’s policies on Copyrightable Material and on Copyright and Fair Use in Instruction or contact the Intellectual Property and Technology Transfer Office. the effect of the use upon the potential market for or value of the copyrighted work. The fact that a work is unpublished shall not itself bar a finding of fair use if such a finding is made upon consideration of all the above factors. A copyright may also be conveyed by operation of law and may be bequeathed by will or passed as personal property by the applicable laws of interstate succession. A trademark is a word, name, symbol or device which is used in trade with goods to indicate the source of the goods and to distinguish them from the goods of others. A service mark is the same as a trademark, except that it identifies and distinguishes the source of a service rather than a product. The terms “trademark” and “mark” are commonly used to refer to both trademarks and service marks. Trademark rights may be used to prevent others from using a confusingly similar mark, but not to prevent others from making the same goods or from selling the same goods or services under a clearly different mark. Trademarks that are used in interstate or foreign commerce may be registered with the Patent and Trademark Office. The registration procedure for trademarks and general information concerning trademarks is described in a separate pamphlet entitled Basic Facts about Trademarks. Are there federal regulations governing the use of the designations TM or SM with trademarks? No. Use of the symbols “TM” or “SM” (for trademark and service mark, respectively) may, however, be governed by local, state or foreign laws, and the laws of the pertinent jurisdiction must be consulted. These designations usually indicate that a party claims rights in the mark and are often used before a federal registration is issued. When is it proper to use the federal registration (®) symbol? The federal registration symbol may be used once the mark is actually registered in the U.S. Patent and Trademark Office. Even though an application is pending, the registration symbol may not be used before the mark has actually become registered. The federal registration symbol should only be used on goods or services that are the subject of the federal trademark registration. [Note: Several foreign countries use the letter R enclosed within a circle to indicate that a mark is registered in that country. Use of the symbol by the holder of a foreign registration may be proper. In most states a trade secret is a formula, pattern, physical device, idea, process, compilation of information or other information that provides a business with a competitive advantage and it is treated in a way that can reasonably be expected to prevent the public or competitors form learning about it, absent improper acquisition or theft. The value of the information to the business and how difficult it would be for others to properly acquire or independently duplicate the information. A trade secret of another cannot be disclosed in your work or verbally. Tangible research materials are any materials, substances or articles created or used in research including, for example, genes and constructs from a molecular biology program, samples of novel photovoltaic solar cell materials, or composite gaseous diffusion membranes for fuel cells. In recent years, biological materials have proven particularly valuable since they may be cumulative of past developments and be self-reproducing, providing future supplies of the material and technology. A decision to release or accept a tangible research material can have far-reaching consequences since such materials are frequently cumulative of advances in technology and carry personal property rights, which can severely limit the practice of future inventions made using the materials. 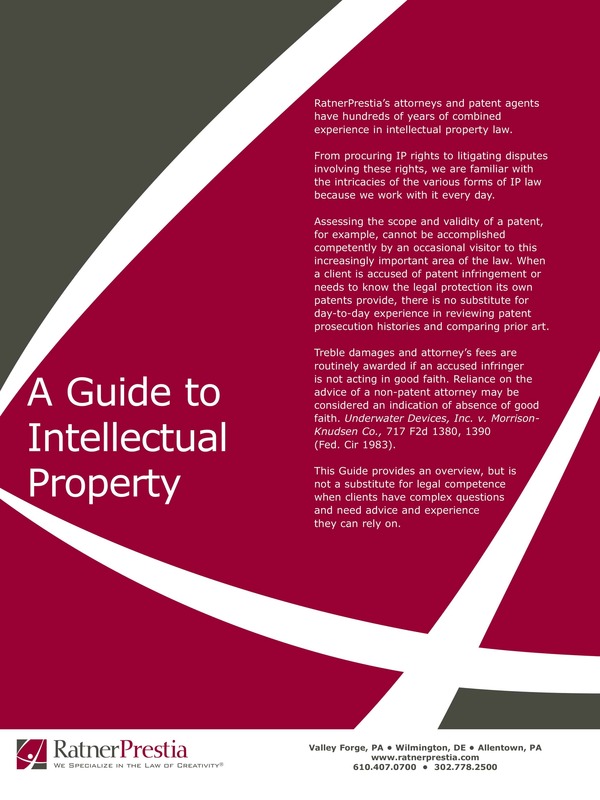 Premature transfer of tangible research materials can constitute disclosure and/or public use of an invention and trigger statutory bars under the patent statute. They also provide an opportunity to the recipient to quickly advance work in the area and make inventions University staff would have expected themselves. Of greatest concern, however, would be the use of materials acquired by a University researcher without a legal right, thereby blocking future commercialization of the fruits of an entire research program. Careful attention to the right to use acquired material has become critical over the last 20 years with new law being created due to developments in the biotechnology field. Tangible research materials made by faculty, staff or students in the course of employment at the University of Delaware, or work directly related to professional or employment responsibilities, or work carried out on University time, at University expense, or with substantial use of University resources under grants or otherwise, is the property of the University. Data obtained from the use of tangible research materials in research at the University legally belongs to the University, not to the individuals who produced the data. Tangible research materials made by non-employees working with a faculty or staff member under the above conditions are also the property of the University. 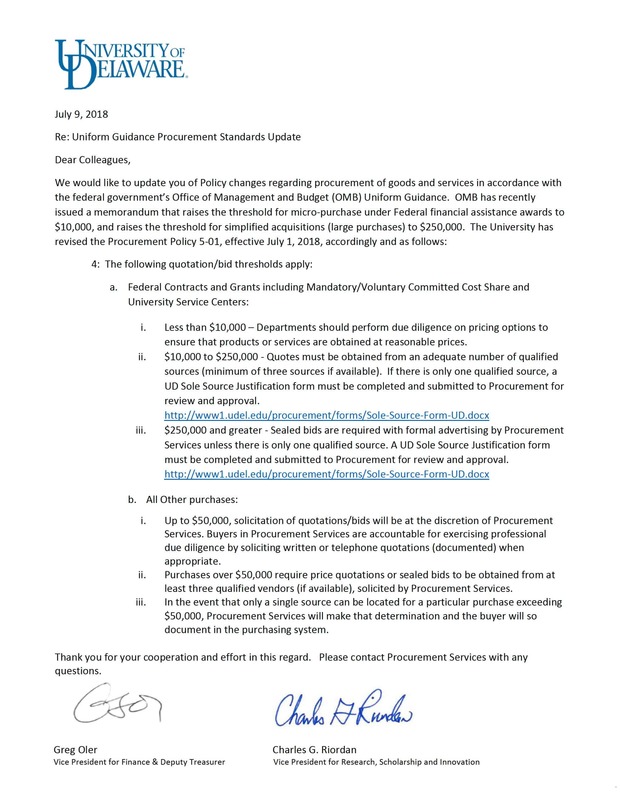 If the University or faculty, staff or students wish to make such materials available to the research community, such access is under the aegis of a material transfer agreement executed by the University. Questions or requests to review material transfer agreements for signature should be addressed to the Intellectual Property Center. 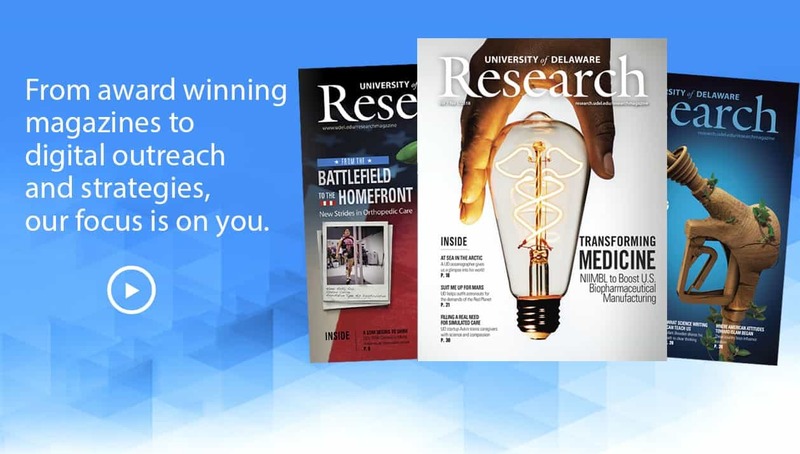 The research activities of the University may create a broad range of intellectual property and tangible research materials, defined as data acquired or generated by faculty, staff or students in the conduct of research. Under federal regulations, data includes all recorded information, regardless of the form or medium on which it is recorded, including writings, film, sound, pictorial reproductions, drawings, designs or other graphic representations, manuals, forms, diagrams or flow charts, data files, data processing or computer programs, statistical records and other research data. Data includes all information and materials commonly accepted as necessary to validate research findings. Frequently, data is used to define forms of intellectual property, such as patentable inventions or copyrightable works, and on occasion may itself constitute trade secret intellectual property. Data obtained by faculty, staff or students in the course of employment at the University, or work directly related to professional or employment responsibilities, or work carried out on University time, at University expense, or with substantial use of University resources under grants or otherwise is the property of the University. Data obtained from the use of tangible research materials in research at the University legally belongs to the University, not to the individuals who produced the data. Ownership rights in data may be subject to the specific terms of sponsorship or other agreements. University research is subject to U.S. Export Control laws that protect national security and trade, including the International Traffic in Arms Regulations (ITAR), implemented by the U.S. Department of State; the Export Administration Regulations (EAR); and the Commerce Control List (CCL), implemented by the U.S. Department of Commerce. The Office of Foreign Asset Control (OFAC), which is part of the U.S. Department of the Treasury, also is responsible for administering and enforcing economic and trade sanctions against certain nations, entities and individuals. These regulations control the export of strategic information, technology and services to foreign countries, as well as to foreign nationals inside the United States. Temporary export of controlled items, including laptop computers with controlled technologies, such as encryption software or technical project data, also falls under the regulations. Failure to comply with these laws can result in serious consequences, including penalties of up to $1 million in fines and up to 10 years in prison per violation. The Research Office will work with individual researchers to make all necessary checks of the ITAR, EAR and OFAC regulations to determine when licensing is necessary for shipment or disclosure to foreign countries or nationals. For assistance, please contact Associate Vice President for Research and Regulatory Affairs Cordell Overby. The Memo on Export Controls and Trade Sanctions gives general information about the Export Control regulations, as they apply to the academic research community. The Travel with or Transportation of Research-Related materials and Data Memo explains the issues and steps for compliance when traveling. The Export Control Decision Tree may be used to help determine if projects are subject to the Export Control Regulations and to learn how to obtain further project-specific information to make sure the work remains in compliance with the laws. Note: University personnel traveling to OFAC sanctioned/embargoed countries, which at the time of this writing include Cuba, Iran, North Korea, Syria and Sudan, should contact the Research Office – Associate Vice President for Research and Regulatory Affairs Cordell Overby, or University Research Advisor Sean Hayes – for guidance prior to travel. UD personnel should travel with a “clean” laptop that contains software and data that are not export controlled. In this way, previously utilized and generated export controlled software and unpublished research data will remain at home or work and, therefore, are neither exported nor deemed-exported. University research is subject to U.S. Export Control laws that protect national security and trade, including the International Traffic in Arms Regulations (ITAR), implemented by the U.S. Department of State, and the Export Administration Regulations (EAR) , implemented by the U.S. Department of Commerce. The Office of Foreign Asset Control (OFAC) , which is part of the U.S. Department of the Treasury, also is responsible for administering and enforcing economic and trade sanctions against certain nations, entities and individuals. Streamlined access to the health and safety programs include compliance with national and local environmental, health and safety regulations, which assure laboratory and occupational workplace safety; Chemical Hygiene and Biological Safety Program compliance, training and waste management; reaction and prevention programs to fire, hazardous materials and other building emergencies; training and compliance to clean air, water and radiological usage; and the safety committee program which includes accident/injury reporting, prevention and building assessments. 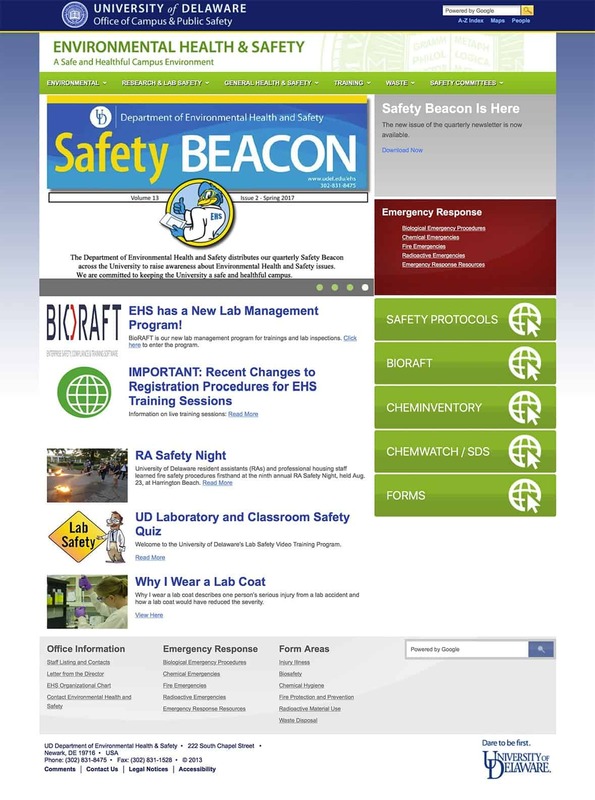 The department provides a multitude of laboratory, health and safety training opportunities through EHS Assistant Online Training, monthly scheduled training and special training requests. 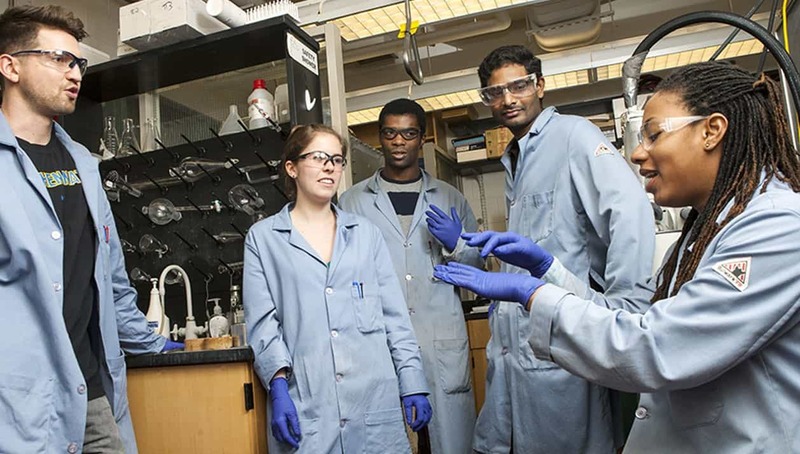 The University’s Biosafety program is established to protect individuals from exposure to biohazards through the application of administrative and engineering controls. The program is managed by the biosafety officer and has oversight by the University Biosafety Committee. The program is described in the various subject areas on the EHS Biological Safety page. Additionally, any Biosafety issues may be addressed to Krista Murray or by phone at 302-831-1433. The University Chemical Hygiene Committee facilitates the implementation of the program through the Department of Environmental Health and Safety and develops and maintains the University’s chemical hygiene plan. Further information on the program can be found on the EHS Biological Safety Page. The University of Delaware holds a USNRC Type A Broadscope License to use radioactive materials at its campuses in the state of Delaware and in coastal waters, as well as at sea. The day-to-day operations of the program are managed by the radiation safety officer assisted by the radiation safety technician. Questions regarding radioactive materials may be addressed to William Fendt or call 302-831-1434. Research involving recombinant DNA is regulated through the National Institutes of Health (NIH) in its Guidelines for Research Involving Recombinant or Synthetic Nucleic Acid Molecules. All work involving recombinant DNA at the University must be approved by the University Biosafety Committee and the biosafety officer. Below is information on the procedures, the necessary forms and the current Guidelines. Anyone working on a recombinant DNA project that is covered by the NIH Guidelines must complete Recombinant DNA training prior to initiating work and, subsequently, every three years. The training is available online or through EHS. Please see the EHS training schedule for dates. 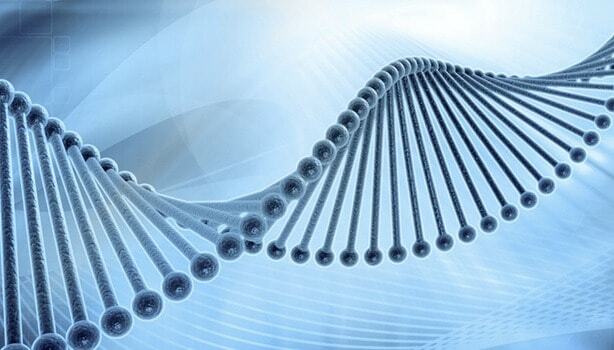 Specific program elements are available on the EHS page for Recombinant DNA. Questions concerning Recombinant DNA registration issues may be addressed to Krista Murray or call 302-831-1433.